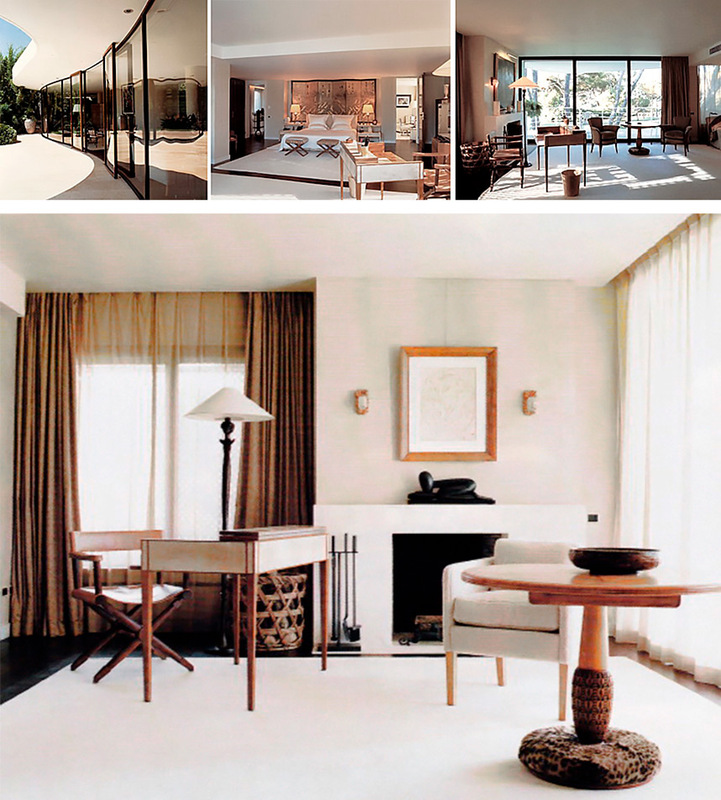 Villa Nara Mondadori was designed by Oscar Niemeyer in 1968 on Saint-Jean-Cap-Ferrat, in southeastern France – a favourite holiday destination among the European aristocracy and international millionaires. Oscar Niemeyer was a Brazilian architect considered to be one of the key figures in the development of modern architecture. Niemeyer was best known for his design of civic buildings for Brasília, a planned city that became Brazil’s capital in 1960, as well as his collaboration with other architects on the headquarters of the United Nations in New York. Nara Mondadori is not an aggressive or rigid Modernist villa of right angles, soaring vertical volumes and steely surfaces. Niemeyer’s brand of modern was organic. Here undulating walls of expansive glass and an amorphous, amoebic-like roofline curves in and out of a tropical setting more reminiscent of the architect’s home country, Brazil, than the Côte d’Azur. The property sat unoccupied for about a decade before an anonymous couple purchased it in the 1990’s for its unusual and special atmosphere and wide open, flowing spaces. 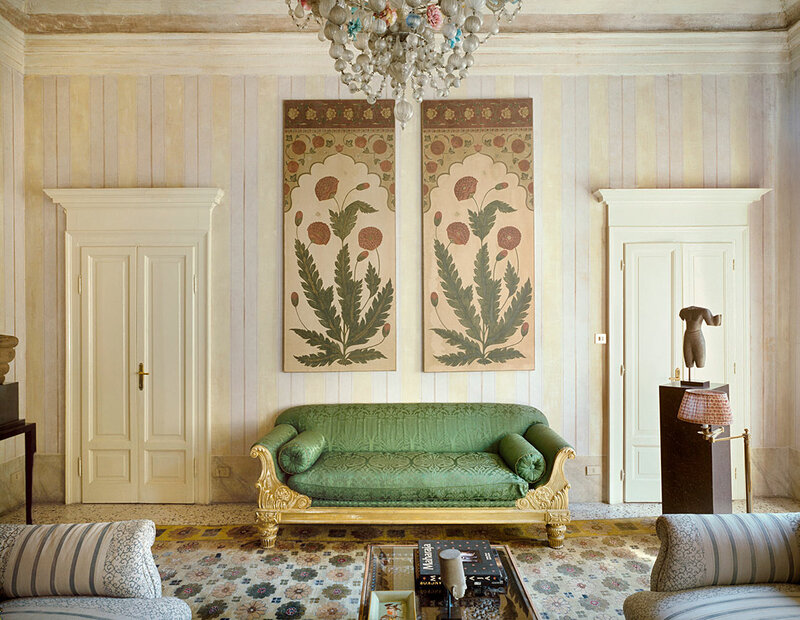 To restore and modify its interiors they brought in architect and interior designer Peter Marino to infuse the villa with his own brand of understated luxe. “It’s the perfect end-of-the-nineteen-nineties statement – it’s all that’s been modern in the twentieth-century, starting with the Wiener Werkstätte, with Eileen Gray, Charlotte Perriand, Eugène Printz. We collected everything for the house … we got twenties, we got thirties, we got forties. Giacometti from the fifties – all the Moderns” said Marino. The dining room was originally sunken, conversation pit style. The walls are covered in strips of straw inspired by Jean-Michel Frank. Ancient limestone busts from Palmyra on bronze plinths survey the room beneath Picasso works on paper. Yves Klein’s Sponge Relief, 1957, hangs above a Marino-designed console. The bronze chandelier is Giacometti. The dining room was originally sunken, conversation pit style. The walls are covered in strips of straw inspired by Jean-Michel Frank. Ancient limestone busts from Palmyra on bronze plinths survey the room beneath Picasso works on paper. Yves Klein’s Sponge Relief, 1957, hangs above a Marino-designed console. 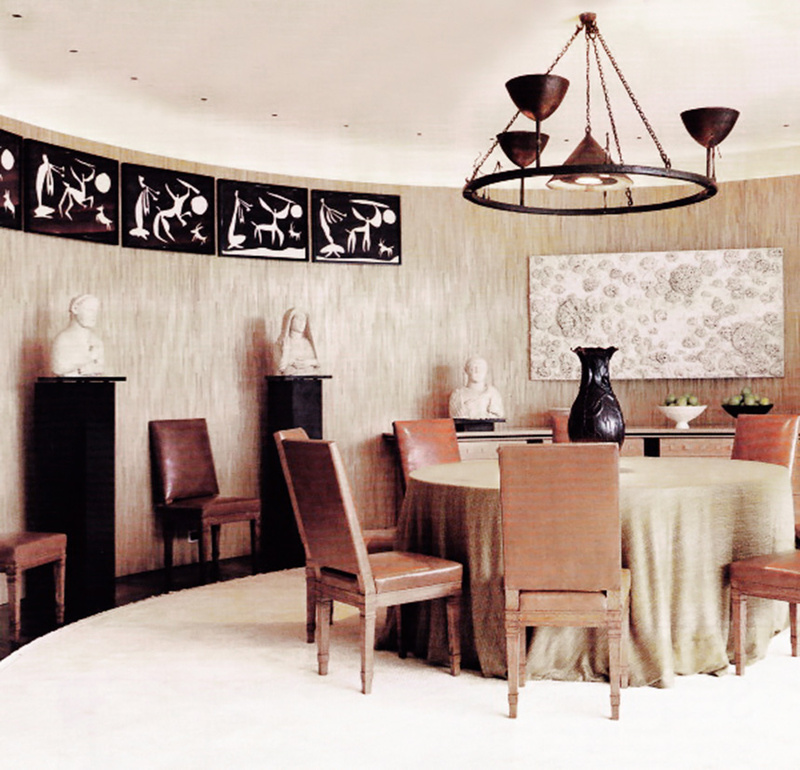 The bronze chandelier is Giacometti. 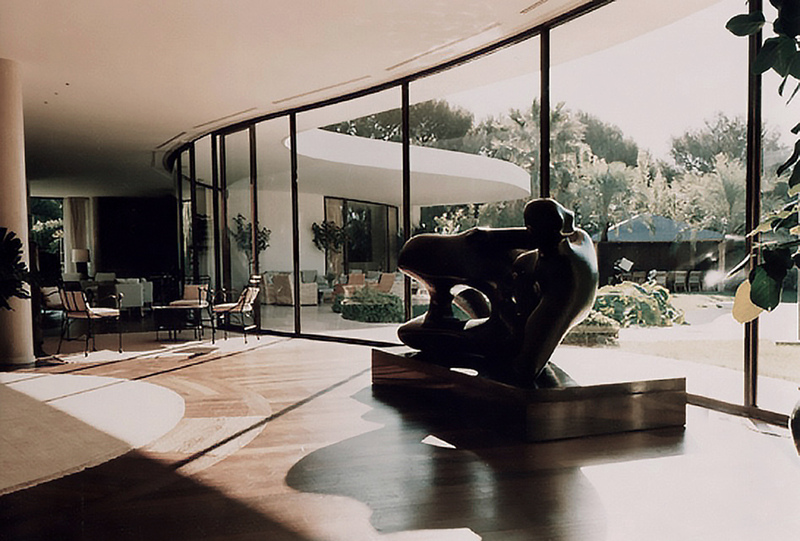 Marino opened the flow from one room to the next by eliminating some walls, playing up Niemeyer’s arcs and curves. 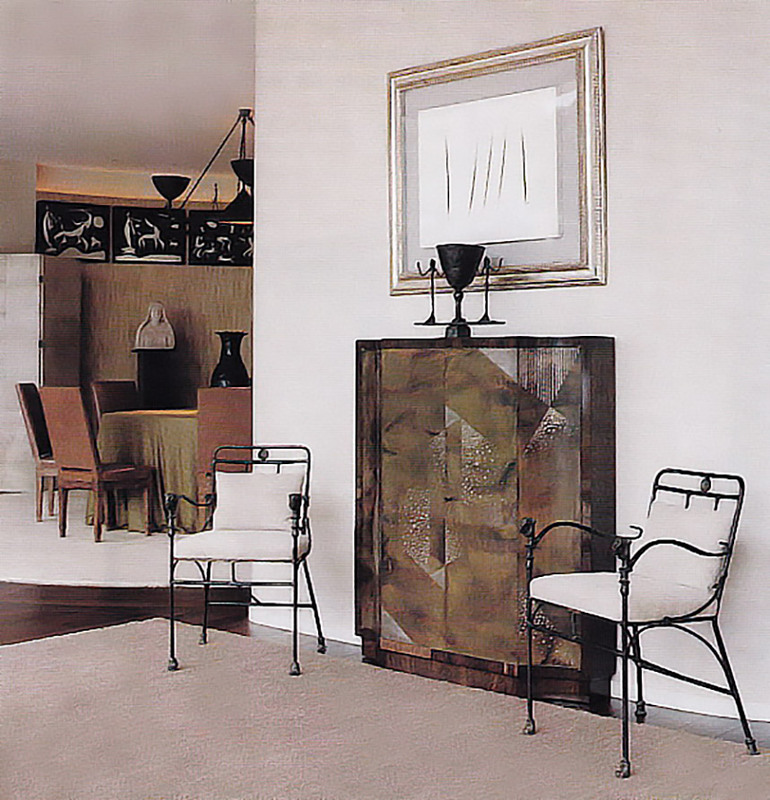 A table by Eyre de Lanux is centered in a conversation area with cane chairs by Jean-Michel Frank. Two works by Lucio Fontana hang over a pair of white upholstered club chairs in the library. 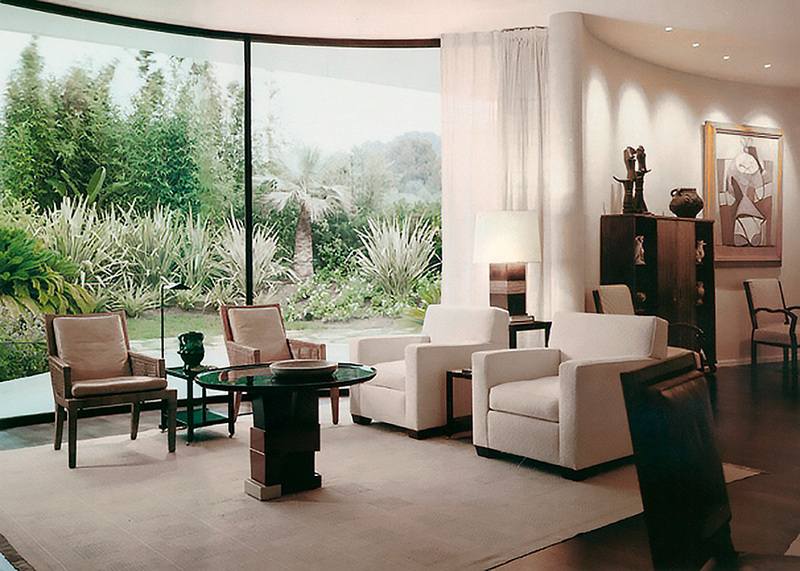 The slipper chairs are by Paul Dupré-Lafon. 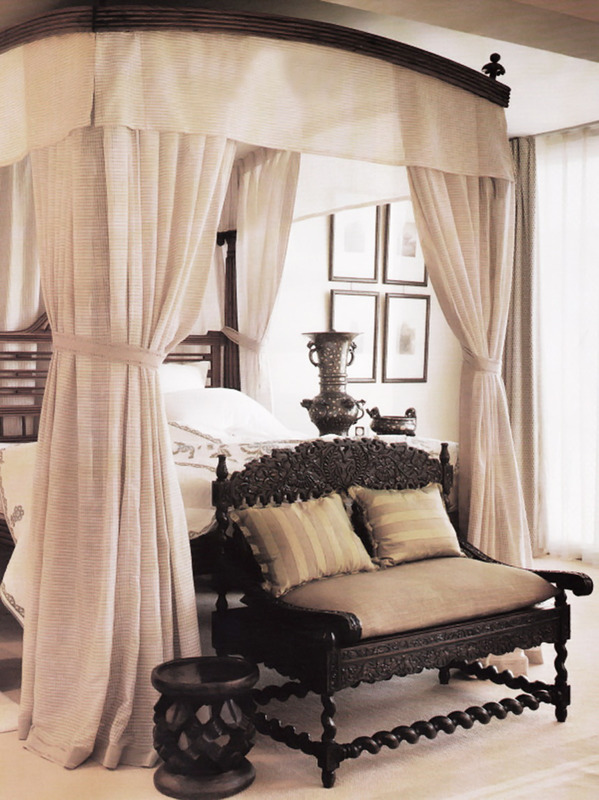 The Macassar ebony and parchment side tables are by Clement Rousseau.